Apple’s App Store officially opened in 2008, but three years on and it has already offered a countless number of apps to very receptive Apple fans. How receptive are they? Apple says it is nearing its 25billionth download. This is a huge number and an amazing milestone so Apple is going to celebrate it with a contest. The winner of the contest will receive a $10,000 gift card that can be used on Apple’s online stores, namely, the App Store, iBook Store and iTunes Store. The contest is slightly baffling though, if you look at the fine print. Based on the contest mechanics, you don’t even need to download anything to be eligible for the contest and win it. It is open to anyone, whether you’re an app downloader or not. You can enter the contest by providing some personal information to Apple at its contest page. A person can enter up to 25 entries a day. In other words, even the contest is about the numbers. Personally, it would have been a better idea if it is limited to actual iOS users who download apps because they’re the real reason for the App Store’s success. How will the winner be determined? The entry that is sent immediately following the download of the 24,999,999,999th app will be declared the winner. 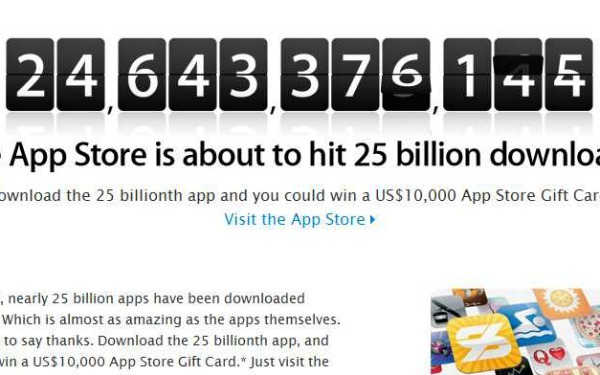 So in essence, the 25 billionth app download may not be an actual app download at all. 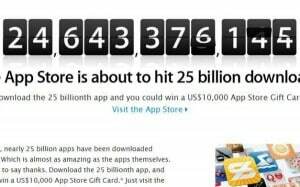 Apple also held the same contest to mark the 10 billionth app download. A UK woman won a $10,000 App Store gift card.